For states across Central and Eastern Europe, 2018 marks the centenary of their national independence, gained in the aftermath of WWI. In the case of the Baltic States this independence was, of course, lost in the aftermath of WWII, when they became not simply a part of Comecon and the Warsaw Pact, but were directly incorporated into the Union of Soviet Socialist Republics. Following the collapse of the Soviet Union, the Baltic countries initially reverted to their pre-war constitutions, seeking to affirm political legitimacy in terms of a restoration of sovereignty, rather than simply an assertion of “post-Soviet” independence. If the principle of “small nations” foreign policy is the forging of alliances, then the accession to the EU and NATO during the 1990s was another momentous historical change, even as these alliances are now beset by new challenges. (Paradoxically, Brexit may even have a unifying effect for the EU 27, faced with the rise of European nationalist parties.) Other destabilizing effects come not only from Russian interference in European political processes, but from the seeming disregard for historical understanding within the Trump administration, whether regarding Europe, the Korean peninsula, or climate change. By contrast, learning not only about, but also from, history has always been a touchstone of liberal education, one medium for which is, of course, theatre – a practice that remains state-supported throughout Europe. 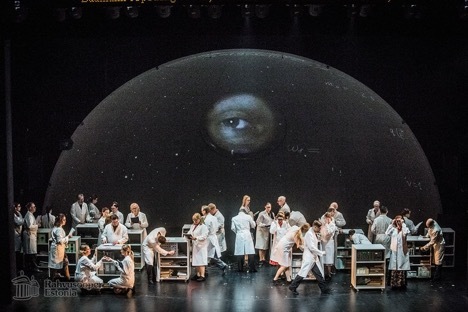 In Estonia, the 1918-2018 centenary has been commemorated by a unique, year-long theatrical project – Tale of the Century – consisting of collaborations between big repertory theatres and small independent companies from all over the country, creating 13 productions, each focusing on a particular decade – with one addressing the next 100 years also. The Estonian government made specific funds available to the country’s union of theatres, which organized both the collaborations and the assignment of decades by lottery. How the companies – ranging from the national opera to a small touring group specializing in comedies – then used the funds was, of course, left entirely up to them. For the independent groups this often meant a significant budget to realize a project that would not otherwise have been possible; while for major institutions these specific funds for a new commission could be supplemented, if necessary, from their existing budgets. Needless to say, not all of the collaborations worked out and some of the productions referenced their allotted decade rather tangentially – although whether the final piece was what would have been made with the themes anyway was not necessarily obvious. As part of this year’s Estonian theatre festival, held annually in Tartu, all the Tale of the Century productions were brought together in one week. Performed with translations (thanks to the Estonian Theatre Agency), the festival also invited an international audience – mostly from the Baltic region – to see them. This was a privileged opportunity to learn about how the idea of a national story (in the tensions between myth and history, “archive and repertoire” might itself refract the range of Estonian theatre (or, rather, theatres) today. Despite the device of the lottery, which forestalled any singular direction to the whole project, there still seemed to be some latent expectation in their reception that the productions might provide evidence for something of an identifiable Estonian “national character.” After all, theatre is itself one of the inherited national forms of cultural representation and audiences – despite the diversity of theatrical languages – still seem to look for an understanding of what it might mean “to be Estonian” today from the centennial project. The appeal of – and to – such a phantom of “national identity” remains emblematic of populist politics, of course; as well as being typical of the era of authoritarian governments across the region during the interwar period, still mostly conceived of as the founding era of (pre-Soviet) national sovereignty. This phantom is also a cause of ambivalence for those of other political persuasions, addressed, for instance, by Chantal Mouffe in her advocacy of a left-wing, “alternative” populism. As taken here – from a 1935 Estonian government publication for Anglophone visitors, which I found in a second-hand bookshop while in Tartu – the following suggestion is, after all, still resonant: “Estonian cultural life reflects the national aims and peculiarities of the people. If character is moulded by difficulties, the Estonian national character developed in the hardest of schools . . . .” Although eliding “cultural life” with “national character,” in a claim to speak for “the people,” remains an ambition of many politicians today, this was happily contradicted in certain respects by the centenary commissions. The ways in which, nonetheless, many of the productions conformed to such an expectation – which is, perhaps, the more interesting aspect to review, as it suggests that an “internationalist” perspective may itself be anachronistic – will be considered in the second part of this essay.